providing the opportunity to browse through a number of Walt Whitman poems! forever span them, and compactly hold them, and enclose them. At about 9am on Sunday morning, The Sapling and I headed out to l'Eglise (church) St. Sulpice. We worked our way through the Marais to a bridge crossing the Seine to Isle St. Louis, then down to Isle de la Cite, past Notre Dame, and then across to the Left Bank and the Latin Quarter. 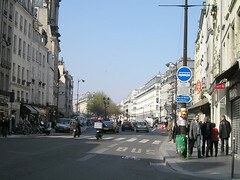 Then we wended our way to Boulevard Saint Germain, a throughway created by Baron Hausmann, and finally over to St. Sulpice. It was another beautiful morning, and the city was just waking up. We were intent on getting to St. Sulpice by 10:15am, because the organist begins the prelude for the first Sunday service then. And St. Sulpice is home to one of the finest pipe organs in Paris. 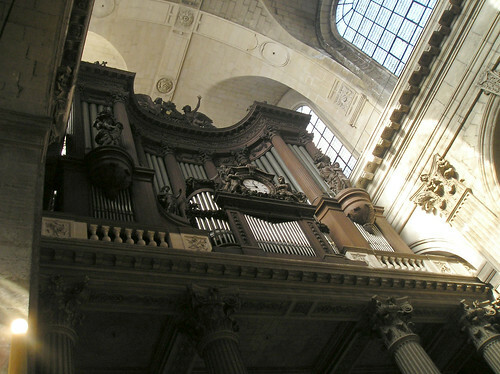 (For specific information regarding this organ and more pictures, see Les orgues de Paris.) 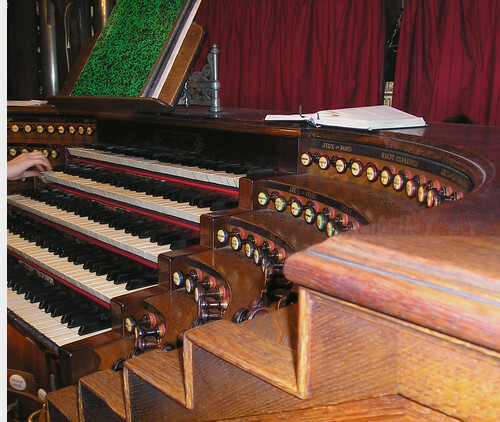 Even more exciting is the fact that after the postlude for the first service, visitors can go up to the organ loft and see the console and organ up close. And then, one can hang out and watch the organist play for the second service! I had found the specifics on this in an article by Steve Fox on Rick Steve's travel website. The organ is set in a loft in the back of the church. The console faces towards the nave just behind the pipes below the clock (see the picture above). We sat ourselves down, along with a number of others who were clearly there for the music, not for the service! The organist, who we later found out was Daniel Roth, Organist Titulaire (the head organist), played a stunning improvisation for the prelude that showed off the capabilities of this massive five rank keyboard. We then sat through the service, some of which was supported by a smaller second organ in the front of the church. At the conclusion of the service, Roth played a spectacular postlude. We wandered around the back of the church trying to figure out where the door to the stairs going to the loft was. 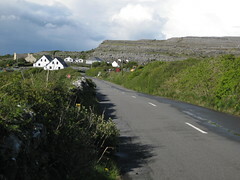 Slowly, a group of people gathered on the left side (facing back). And, sure enough, after the postlude was finished, we were invited up. We climbed up a stone spiral staircase. Then we walked past the original hand bellows. On the right, Roth's program for the day was posted. We then came around and were able to meet Roth and admire the organ. He was remarkably gregarious and happy to talk to everyone. (More on Mr. Roth and the organ in a subsequent posting.) We hung out through the second service and had a wonderful time watching him play. The photo below was taken on the right side of the organ loft facing the nave as we were leaving. My mother passed away in July 2006. Her Steinway grand piano was a prized possession. Her parents bought the piano for her in the 1940's when she was in college. They lived in Queens, New York and it is hard to imagine how they fit the piano, two adults and three kids into the one floor of the house that they lived in. Her brother and sister recall that they took out a loan to buy the piano. My mother was an accomplished pianist and organist, and obtained a Master's degree in Sacred Music from Union Theological Seminary. When my mother moved to Oregon, it took a while for the piano to follow. However, in the late 1950's there was an exchange of the Steinway grand for the spinet my mother had acquired. The story is that the same truck driver took the Steinway out to Oregon and brought the spinet back to New York City to my grandmother's house. 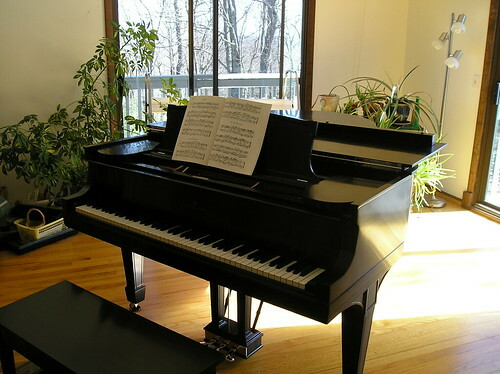 Eventually, my parents decided to move to Prescott, Arizona, and of course, the Steinway came along, moving through several changes of housing. Sadly, as my mother's health deteriorated, she played it less and less, but it stood in a position of honor in her living room. In the last few months of her life, others came and played it for her (and for themselves, as it is a fine instrument). My mother fussed about what was going to happen to the piano, and talked about donating it to a local organization. 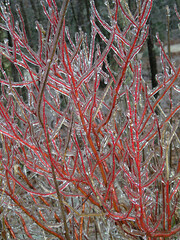 However, The Sapling and I knew we wanted to bring it back to our home in New Hampshire. It turns out that while my mother thought it was a 1925 Steinway, the piano is actually a 1909 Model O. 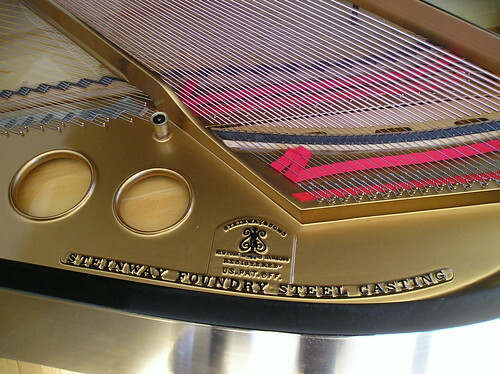 All Steinways have serial numbers, and from the serial number it is possible to determine the date of manufacture and the specific type of piano. I wrote to Steinway to see what they knew about it, and they told me that the piano had been sent to a retailer in Syracuse, New York, and then sold to an individual, which didn't have a city attached to the address. They had no other information. So, we moved it back to New Hampshire, and took it to Peter Mohr at New England Classic Piano Restorations in Manchester NH. We were happy that we did not need to replace the soundboard, and that Peter was able to repair it. 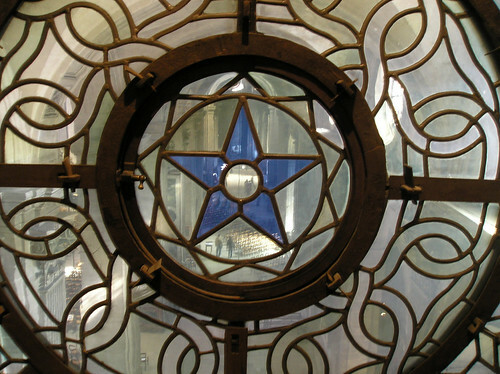 The restoration work took about 5 months, including a complete refinishing. Interestingly, the piano may look better than it did when it emerged from the factory almost 100 years ago. Peter showed us how the harp (the metal part of the insides that the strings are attached to) was not very well finished. Apparently, Steinway was rushing out the Model O's and didn't apply quite as high a degree of finish to some parts. This also explains the difficulty we had in finding the serial number, which is normally inked in a pretty prominent location. 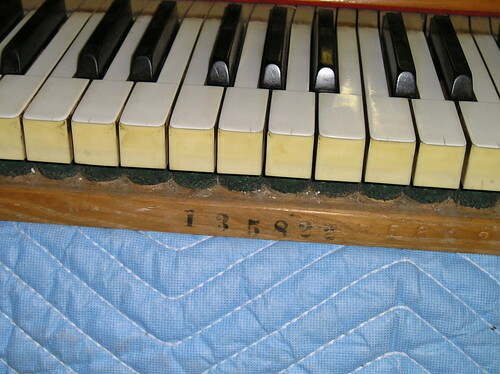 The restored harp and new strings are shown below. The Sapling and I opted to walk after our long plane ride, dragging our bags, all the way from the Arc de Triomphe to our apartment near the St. Paul's station in the Marais. Yes, we knew that we could have hopped on Line 1 and gotten there in quite a bit less time, but, we weren't supposed to arrive before 9:30am and we had plenty of time to kill. Besides, it was an utterly gorgeous morning. As we walked down the Champs Elysee, our main companions were joggers and the sidewalk/street cleaners. The walks were getting brushed and washed. A few of the store ownere were starting to straighten up for the coming day. The air was quite stunningly clear -- most of the days we were in Paris suffered from a fair amount of air pollution that reduced views considerably. 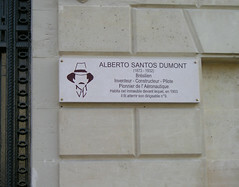 We (or maybe just I) were amused to see a plaque for Alberto Santos-Dumont, the namesake of a local coffee house back in southern New Hampshire. Santos-Dumont was a Brazilian and an early aviation pioneer. He studied in Paris and developed various lighter than air vehicles that circumnavigated the Eiffel Tower. We progressed past the store fronts, including the ubiquitous McDonalds, and continued through a park to the Place de la Concorde. 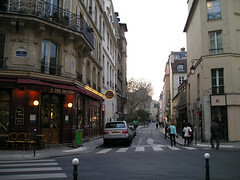 We swung left and then headed down the Rue de Rivoli, a straight shot to the Marais. In the Marais, the Rue de Rivoli is one of the oldest streets in Paris, dating back to Roman times, and is not a product of Baron Haussmann's reengineering of Paris in the 1800's. 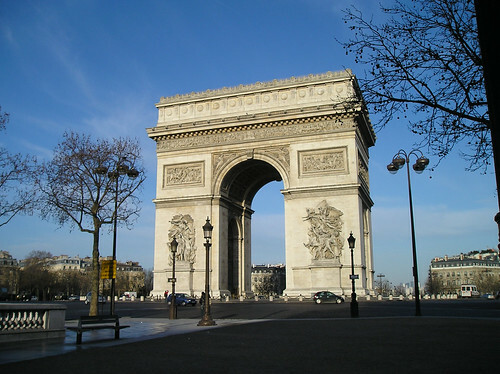 However, first it runs past major sites and products of later times such as the Jardin des Tuileries and the Louvre. 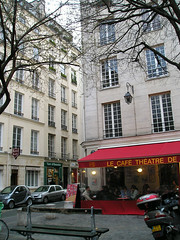 Then, the street becomes very commercial with stores, cafes, restaurants and various other shops. At long last we arrived at the St. Paul's station, and headed for our apartment on Rue de l'Ormesson and across from the place du Marche Sainte-Catherine. We discovered that the apartment was seriously fortified, with a strong door and lock on the street, plus a substantial lock on the apartment. We struggled for sometime to figure out the key and lock on the apartment, which was unlike any U.S. key we had ever seen! The Sapling and I took a one week trip to Paris in March, 2007. 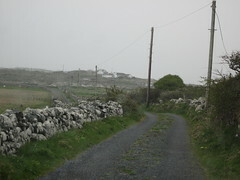 We were blessed with especially fine weather for all of the week up until the day we left. We chose to stay in an apartment in the Marais, and then developed our own scheme of touring each day as our energy and interests dictated. Coming from the U.S., we arrived at Charles de Gaulle (CDG) at 6:30am Saturday morning, that compressed the night time into about six hours. East is my least favorite direction to travel! CDG was a fascinating place, with travelers coming from all around the globe, including cities in Africa that I did not recognize. Our bags took forever to emerge. We then took the Air France bus into the city (about 12 Euros per person). The bus dropped us at the Arc de Triomphe. It was a spectacularly clear and brisk morning. We decided to walk to the Marais, hauling our bags. As we headed down the Champs Elysee, I turned around and captured this shot. The Arc is luminous and in sharp contrast to the deep blue sky. We are getting our first significant snowstorm of this year today. One of my favorite things to do during a snowstorm is play Judy Collins' song, The Blizzard. You can find this song on her Fires of Eden album. Here are the words. Looks like there might be a blizzard tonight.